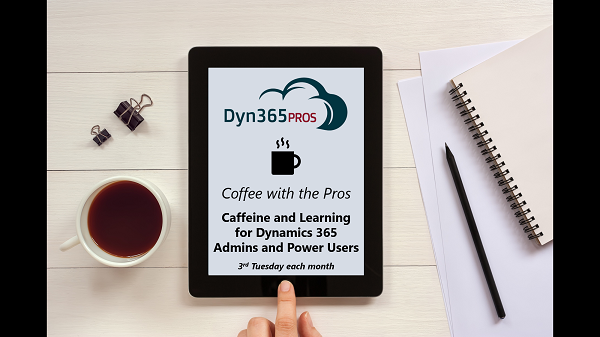 The Dyn365Pros team is proud to announce a new Dynamics 365 Training Series – Coffee with the Pros. This will be a free, regular, webinar training series full of tips and tricks. This series is geared to Dynamics 365 Users, Power Users, and Administrators. As the name suggests, grab a cup of coffee and join one of our certified Dynamics 365 consultants for a focused, 15 minutes of Dynamics 365 Learning. The Dynamics 365 training series topics will be relevant and the learning will be invaluable. Whether it is new, powerful functionality or best practice reminders, every User will find value in this 15 minutes. Your first session is scheduled for Tuesday, May 16th at 9am PT. Topic will be the new Dynamics 365 Editable Grids – how to enable and get started with them. You can register for this session HERE. Coffee with the Pros sessions will be scheduled every third Tuesday of the month, don’t miss out! Stay tuned to our website and social media for registration links to upcoming sessions. If you have any suggestions for topics you would like us to include in future sessions, please email us at Learning@Dyn365Pros.com and let us know. Keep up to date about our Learning events, functional blog posts, or other tips and tricks webinars, by making sure you are signed up for our newsletter. Sign up below where it says GET UPDATES. We look forward to having coffee with you!